Away: What was the occasion of your family trip, and why did you choose your destination? The Racco Family: We travelled to Dove Mountain over a long weekend in the fall. Our family chose Dove Mountain due to its outstanding reputation for being a family-friendly luxury resort in Tucson, Arizona. We were looking for an environment that would allow us to be entertained while on property but also have access to other Tucson hot spots. We were at Dove Mountain for four days. While in Tucson, we were able to visit Old Tucson movie studios, golf, horseback ride, sample local restaurants, discover regional agriculture, hike in the Sonoran Desert, get up close with mid-west wildlife, practice yoga and swim in the hotel’s pools. The climate was perfect for enjoying outdoor activities and staying very active throughout our visit. It is always important to accommodate a wide range of opinions when planning our itinerary and having the ability to maximize our stay to each individual’s preferences. Even when considering our “relaxation” time, there were plenty of options, such as renting a bike to travel the resort or listening to the sounds of native flutes by the campfire. The MacEwan Family: Dan, my husband, and I flew to Phoenix, rented a car, and drove down to Tucson (less than a 2 hour drive) on Friday March 14th to Tuesday March 18th. We just wanted to relax, so we spent 3 quiet nights at the Ventana Resort in the Tucson area. Dan and I were able to spend some time in Old Scottsdale as well, which was wonderful. We had been to Phoenix before, but never to Tucson (which once used to be a part of Mexico before it became part of the USA!). Great food, friendly people, and great weather – what more could you want out of a vacation!? Away: What was your most memorable part of the experience? The Racco Family: Without question, the most amazing part of our trip was the Ridge and Ruin Tour that took us along the Alamo Ridge and into the Wild Burro Canyon. The hike was a physically challenging activity moving across varying terrain and elevation levels. We were able to soak in the beauty of the landscape that had been completely foreign to us, with the thousands of saguaro cacti, the red-tinted rock and the long shadows cast by the sun. Our guide, Ranger Rick, was extremely passionate about the surroundings and this translated into an informative experience shared between our family and a fellow couple. 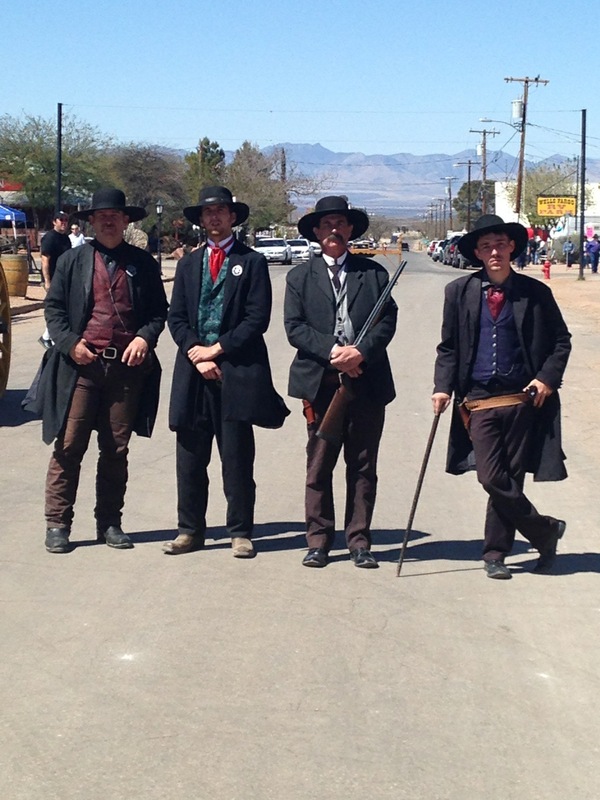 The MacEwan Family: Driving down to Tombstone, Arizona – a fabulous little Old West town. We saw the OK Corral, a Western shoot-out, and an old graveyard – the most entertaining part of our journey. The tombstones were marked with the people buried and how they died – for example, “Shot For Cheating At Cards.” We had a blast walking around and reading the tombstones! Kitt’s Peak was also a must-see, with two radio telescopes representing eight astronomical research institutions on top of the mountain and a nerve-wracking drive up. If you’re going to make it up here, be sure to book your ticket well in advance, as they were sold out when we got up there! The view was great, though. Away: What was most surprising to you about the destination or about the Ritz-Carlton Dove Mountain? The Racco Family: As a whole, we were most surprised by the hotel’s location, literally camouflaged into the natural surroundings of the desert. Unlike other top resorts, its décor relied on simplicity rather than grandeur to pair well with the powerful mountains. We can also say we were not surprised but continuously grateful for the high level of personal service that was given to each guest during our vacation at the Ritz-Carlton! Want to Experience the Real Arizona?